Directions for Cleaning Exterior Surfaces: Apply Descale-It Cooler Treatment liberally to scale-encrusted surfaces by spraying, brushing or wiping. Allow 1/4 to 1/2 hour for product to soften scale, then remove by wiping and rinsing with water If solution has evaporated, remoisten with water to soften scale. Repeat application may be necessary to remove extreme scale build-ups. Directions for Cleaning: Drain cooler and flush with water. Add 1 quart of Descale-It and allow reservoir to fill with water. Operate cooler 3-4 hours until scale deposits have softened and loosened. Remove deposit by rinsing, then drain and flush cooler. Repeat application, if necessary. Directions for Maintaining: Add Descale-It to the water in the reservoir according size of cooler. (1/2 quart for 3-4000 cfm system; 1 quart for 5-6000 cfm system; 11/2 quart for 8000 cfm system. Operate system. 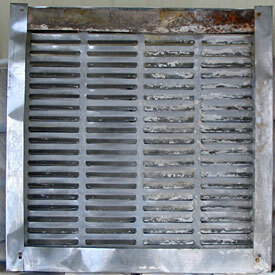 For best results, flush cooler and add Descale-It at least twice each season. Only available in our Descale-It Variety Pack. Take the work out of cleaning! 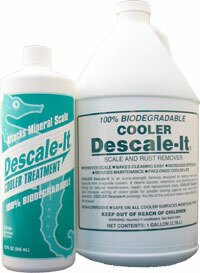 Let Descale-It products do the work for you. Descale-It ® Products Company is committed to producing effective, earth-friendly products. Descale-It Lime-Eater ® was the first product in its class to be Green Cross Certified by Scientific Certification Systems as 100% biodegradable.